Widowed librarian Alicia Fairmont needs answers… After her husband is killed in a hit and run accident, Alicia travels upstate to his hometown of Cobble Cove, New York. She hopes to locate his estranged family and shed light on his mysterious past. Anticipating staying only a weekend, her visit is extended when she accepts a job at the town’s library. Secrets stretch decades into the past… Assisted by handsome newspaper publisher and aspiring novelist, John McKinney, Alicia discovers a connection between her absent in-laws and a secret John’s father has kept for over sixty years. Her investigation is interrupted when she receives word her house has burned and arson is suspected, sending her rushing back to Long Island, accompanied by John. Back in Cobble Cove, cryptic clues are uncovered… When Alicia returns, she finds a strange diary, confiscated letters, and a digital audio device containing a recording made the day her husband was killed. Anonymous notes warn Alicia to leave town, but she can’t turn her back on the mystery—or her attraction to John. As the pieces fall into place, evidence points to John’s involvement in her husband’s accident. The past and present threaten to collide, and Alicia confronts her fears… Has she fallen in love with her husband’s killer? Librarian Alicia McKinney has put the past behind her… Two years ago, Alicia discovered both a terrible truth and lasting love with John McKinney in the small town of Cobble Cove, New York. Now a busy mother of twin babies and co-author of a mystery series, Alicia couldn’t be happier. Alicia’s contentment and safety are challenged… Walking home alone from the library, Alicia senses someone following her, and on more than one occasion, she believes she is being watched. Does she have a stalker? When the local gift shop is burglarized, the troubling event causes unrest among Alicia and the residents of the quiet town. John and Alicia receive an offer they can’t refuse… When John’s sister offers to babysit while she and John take a much-needed vacation in New York City, Alicia is reluctant to leave her children because of the disturbances in Cobble Cove. John assures her the town is safe in the hands of Sheriff-elect Ramsay. Although Alicia’s experience with and dislike of the former Long Island detective don’t alleviate her concern, she and John take their trip. Alicia faces her worst nightmare… The McKinneys’ vacation is cut short when they learn their babies have been kidnapped and John’s sister shot. Alicia and John’s situation puts them between a rock and a hard place when the main suspect is found dead before the ransom is paid. In order to save their children, the McKinneys race against the clock to solve a mystery more puzzling than those found in their own books. Can they do it before time runs out? Welcome Sneaky! Thank you so much for chatting with me today. Could you start by telling us a little about yourself and how you came to meet Alicia? Hi, Mudpie. I'd be happy to fill you in about that. It's a question that I'm often asked by readers. The full story of how I met Alicia is included in the first book of our series, A Stone's Throw, but I will give you the condensed version. Alicia visited Cobble Cove to find out some information about her dead husband's family. Although her intention was not to stay nor get involved with John, the town's newspaper publisher, and the last thing she expected was an offer of employment from the library Director, all three of these events took place. Upon accepting the librarian position, she was invited to stay in the apartment above the library which was my abode at the time. We bunked together and became fast friends. The rest is history and described in more detail in the book including how I became the library cat in the first place. What's a typical day like for you at the library? I do a lot of napping by the books. My friend, Mac, an old gent who is in the spotlight in our first book, placed a bed for me by the local history collection. Now I actually have a whole room to myself outside the staff lounge, and I often attend children's storytimes. I keep the Cobble Cove Library rodent free and also help solve the town's mysteries or at least poke my nose into them. 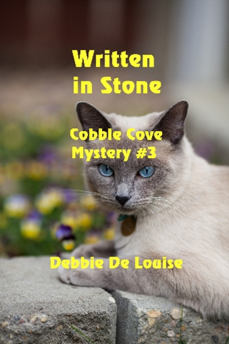 Tell us about the Cobble Cove mystery series that you star in. I star in all three of them: A Stone's Throw, Between a Rock and a Hard Place, and Written in Stone, although I play a particularly large role in the latest, Written in Stone, where I go missing. This book also has my cover image on it, although I have to admit the Siamese model is not as handsome as I am. Do you assist Alicia in any way in solving the mysteries she becomes involved in? I have to admit that even though I help Alicia find a clue in our first book, Fido, my dog co-star actually has more of a role in solving that mystery. In our second book, Between a Rock and a Hard Place, I play an even smaller role regarding the mystery, although I am featured in other important scenes. Fido again sees most of the action, but he doesn't help solve the case. In Written in Stone, both Fido and I find some clues to the mystery, but Alicia and her friend Gilly do most of the investigative work to the new sheriff's chagrin. Is your character based on a real life kitty? Physically, I bear a resemblance to Debbie's Siamese cat, Oliver, although I am younger. In our books, I am only 3 years old while Oliver will soon be 17. Personality-wise, I can say that most cats are similar in their need for food, attention, and sleep not necessarily in that order. I, however, am a character cat and while I act as a normal cat in our books with perhaps a bit more perception, I can enjoy more than nine lives if readers keep reading my books. You're also a fellow blogging kitty! What made you decide to start putting paw to keyboard and what will readers find at your blog? I'm so glad you've heard of Sneaky the Library Cat's blog. I purr-suaded Debbie, who is a librarian as well as an author, to create this blog for me where I could interview fellow cat and other pet characters to give them a voice in their author's careers and to promote their books. I also run a Feature Friday Film section where I show cat videos, and I'm planning two new columns featuring new pet book releases and reviews. As it says on my blog, my mission is "Scooping the shelves of cat Litter-ature" but my blog goes further than that and features pet characters of all species. In one case, I even featured an alien cat. Debbie is working on some other projects, and I'm busy with my blog, so we are going to wait and see how the first 3 books of the series are received by readers. There is, however, talk that Debbie may start the 4th of the series this summer because a fellow author has suggested offering the services of one of her character cats in our the next book. That may mean that I would have more competition but maybe a detective buddy to help me with the mystery. About the author: Debbie De Louise is an award-winning author and a reference librarian at a public library on Long Island. She is a member of Sisters-in-Crime, International Thriller Writers, and the Cat Writer’s Association. She has a BA in English and an MLS in Library Science from Long Island University. Her published novels include Cloudy Rainbow, A Stone’s Throw, Between a Rock and a Hard Place, and Written in Stone. Between a Rock and a Hard Place (Cobble Cove Mystery #2) has been on the Amazon bestseller list for cozy mysteries. Debbie has also written articles and short stories for several anthologies of various genres and a romantic comedy novella, When Jack Trumps Ace. She is currently seeking agent representation for her psychological thriller, Sea Scope. Debbie lives on Long Island with her husband, daughter, and two cats. Sneaky was thrilled to be on the guest side of an interview with a fellow cat for a change. Thank Mudpie (and you) for hosting him on your blog today. Excellent interview! Love Debbie's writing & am looking forward to more! Oh, this series sounds likes it's full of such wonderful suspense and thrill. 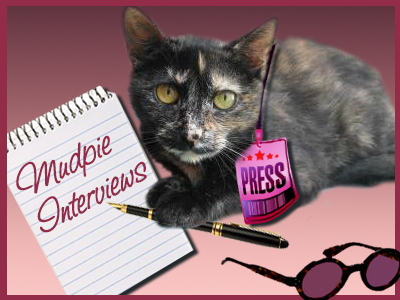 And what a purrfect interview this is, Mudpie and Sneaky! Great interview, Mudpie! This sounds like a good series too! Great interview, Sneaky and Debbie! Wow, those definitely sound like puzzling mysteries. Very interesting, indeed! Wonderful interview!! I enjoyed reading Debbie's blog too. Thank you, Mudpie, for bringing Sneaky and his stories to my attention! i love any author who has 2 cats! Great interview, nice to learn about Sneaky. Great interview, Mudpie. Would live to read more about Sneaky in the books. Great interview and the books sound great too!